Catsup. Or in this case, catch-up. I was so happy to read that I’m not the only one who has a hard time keeping up with that “one block a month” deadline. I can make 120 blocks in a couple of days… but ask me to make only one a month? No can do. Are blocks like Lays Potato Chips? You can’t make just one – it’s all or nothing. That’s food for thought… and no, I couldn’t resist that one. This picture will seem random but I promise it isn’t. I’ll get to that in a moment. Reproduction Sawtooth Star blocks. I have 20 done, but that’s only because I made 6 in one sitting. Pink & Yellow X-Plus blocks. I’m stuck on three blocks, though I did get enough pieces for another 20 blocks cut out so I’ve made some progress. Pink & Yellow Triangle blocks. See above – no sewing but I’ve cut more strips. Soon. Right? Snapshots blocks. I’ve got Block 1 cut out and with Block 2 coming soon, I’d better get busy. 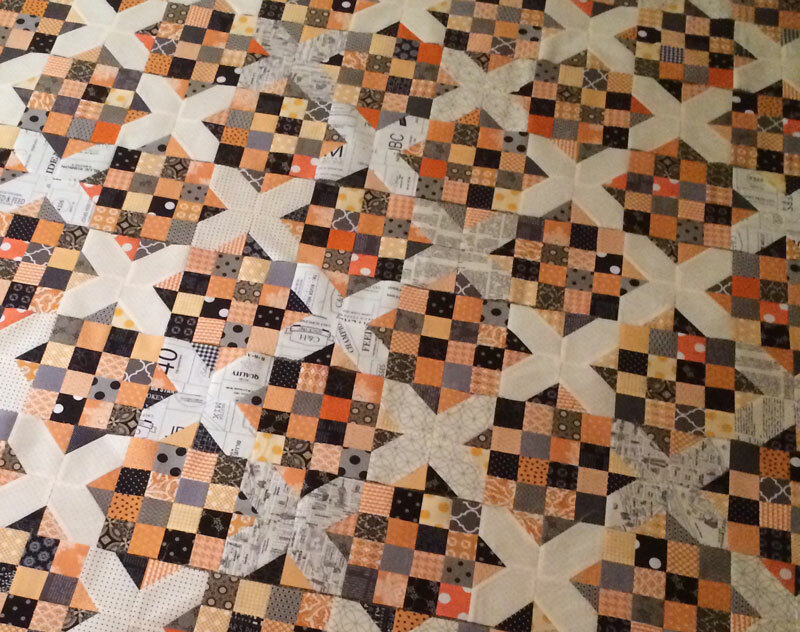 Still, there has been some sewing going on – my APQ quilt-along quilt in orange, black and cream is almost done. I have to make a few more blocks – I obviously counted a couple of my blocks twice because I thought I had enough – and I’m trying to decide how to finish the sides so I’ll finish by Monday. At least that’s the plan. The other reason they stack rather neatly is that I’m a “starcher” or “sizer”. Before I do any cutting, I spray my fabrics with starch or sizing until they’re damp and then I press it until dry with a hot iron. Just so you know, I use both starch and/or sizing depending on which one is handy and which one is on sale at the grocery store. Since I’ve never had any problems with flaking, shiny-surfaces or bugs, and since I go through cans and bottles pretty quickly, I tend to prioritize the cost. Doing this serves two purposes – it shrinks my fabric and makes it very flat for cutting. First – shrinkage. I used to pre-wash my fabric but with pre-cuts and better quality fabric, the necessity to do that was less. And time was sometimes a factor. But I press with steam – a lot of it – and it was causing enough shrinkage that it affected the accuracy of the pieces before and after piecing. The starch/sizing also helps me cut four layers of fabric at a time. I know, I know… other people can do this without requiring starch/sizing. But this is what works for me. It’s next on my “to do” list. The bundle is the coming-soon Collection for a Cause Mill Book 1892 – it rocks – and the lights are from several different collections, some of which are also coming soon. So back to that first picture of Daysail – by Bonnie & Camille. (Like you didn’t already know that.) The bundle has been on the shelf in my office for a few weeks but I just found the little Aurifil thread kit. Even though I have spools and cones of thread everywhere at work and at home, I always find myself wanting to get a few more spools. Are you like that with thread? Do you use one kind for piecing and another kind of applique, quilting or machine-quilting? Do you switch colors for piecing and/or binding? Is there anything you’d like to know about thread? Either a specific brand-question or something general. I’ll tell you that I’m a little boring when it comes to thread. I use 50 wt. Aurifil in 2324 for most of my piecing. It’s only when I’ll be sewing lots of white pieces to white pieces that I will switch to white thread. My favorite pale taupe-tan works perfectly for about 90% of what I do. That’s it for today. I’m grabbing that cone of Aurifil and then I’m off to buy sizing or starch. I’ve got sewing to do this weekend! I know Aurifil is very popular, and I’ve been quite happy with it in the past, but the costs is so prohibitive for me. I buy my thread from Connecting Threads (and I usually stock up when it’s on sale, so I get it really cheap). I use their Essential Thread for piecing and the Essential Pro for quilting. I just use half a dozen neutrals when piecing – white, cream, tan, silver, gray, black, depending on what I’m sewing. I have a stockpile of them – four or five spools each – as well as single spools of many colors that I use when I’m sewing bags, stuffies, etc. I sometimes wonder if I should be using poly thread for the non-quilting projects, but I’ve been lazy about acquiring a lot of poly colors. Well, okay, cheap, too. Your blog is part of my daily routine. Thanks for all the info and the great photos. As for thread, I’m with you on Aurifil for piecing though I tend to use gray most of the time. I use silk as much as possible for applique and experiment with different threads for machine quilting and hand quilting. Superior makes wonderful threads in all colors and contents. Keep the ideas coming. Now I’ll have to start doing four squares! Very interesting blog! Enjoyed it and I love your quilt! Mostly I use Sulky polyester from Joann’s for piecing and cottons for quilting. Not fussy about brands yet. Quilting for 4 years. I like the sulky because it is thin and doesn’t take up space. I use Gutermann 100%cotton for all my applique (I have a thread cupboard so it meets all the colors I need) – presencia for piecing and quilting with my Juki because it is a picky machine and seems to only like that one – I use Connecting Threads Essential in my Janome & Featherweight for piecing – for hand quilting which is what I mostly do I use King Tut variegated and for hand piecing I use YLI hand quilting thread. I think that about covers it! Hi, Carrie. Happy Valentine’s Day to you, too! I’m glad you brought up the subject of sizing and starching, because I’ve had some questions about it. I had an opportunity to hear Anita Grossman Solomon speak at a quilt guild last year, and she’s a strong proponent of starch. I have tried her method, and have learned how to starch properly. She recommends using liquid starch mixed with water, then dipping your fabric into that, chilling the fabric until you are ready to iron it, then ironing it. As long as you wring out the fabric with a towel, this method is fantastic. It beats using the spray can and spraying and spraying and spraying. Dip the fabric once, towel it try, and iron it once. My question, though, has been, what do you do with the leftover fabric that has been starched? I wondered if it was necessary to wash it before you put it back into your stash. I’m really glad to find out that that step is not necessary. Thank you so very much. Btw, I, too, am an Aurifil thread lover. I’m cotton all the way. I used Aurifil to piece and then Isacord to quilt. I love the XOXO quilt! I am an #AurifilThreadSnob. I use it for all my sewing. In my sewing machine, for hand applique’, hand piecing and hand embroidery. I just started using Aurifil floss for hand embroidery and I love it. I match my thread to fabric. I use 50wt 2 ply. I love thin thread. I would like to try Aurifil in 60 wt. Any chance Alex Veronelli will read this? Thank you Carrie for another great posting. I use Presencia 60 wt for piecing. This was the first thread I ever tried, and it’s perfect. I can’t break it, there is very little fluff, and my bobbins last ages. I use Isacord polyester thread for quilting. I have a couple of small spools of cotton quilting thread that I bought before I discovered Isacord, that I want to get used up. I also have a spool of invisable thread for applique, so I don’t have to have a matching colour. Also, all of my threads are neutral, so they go with everything! I’m an Aurifil girl…piece with 50 wt. usually in White or Beige or Very Light Grey…quilt usually in the same colours, but also have a collection of 40 Wt. Aurifil threads (thank you, Hawthorne Threads for carrying such a great selection) for when I want the quilting to be the hero of the project. I do have some Sulky Blendables…but they make my machines (both of them) sulky, pouty and whiny – no matter what I do with tension. Hmmmm….. I use two threads interchangeably but I do always use grey for my general piecing. I used to use Presencia 60 wt but have been buying Aurifil 50 wt lately. Both are pretty hard to find at a reasonable price point so when I do the damage I do it in one swoop and get it over with. I might go white if I am using a white background with light tones but mostly I use a light grey. For my applique I have been using superior threads super bobs and they are just right. SOOOO thin and since they come in many colors on the wheel I tend to find a matching color without investing a lot of money into a full spool. I am bit old school and still prewash everything (except layer cakes and charm packs). I starch it all before cutting and like the results. Never had an issue with shrinking or bleeding (knock on wood and all that). I’ve won some Aurifil threads a while ago and I love it! and the best thing? Finally, something is cheaper in Germany than in the USA (I think it’s because Aurifil is made in Italy and the distance to Germany isn’t that much). Sad thing, non of my LQSs carry it so I need to order it online. But I found a great store with a good selection and shipping over 25€ (3 spools) is free. What I always want to know: why should you use the same material of fabric and of thread (let’s say cotton thread and cotton fabric)? Is it because it will shrink the same way? And can thread age and become unuseable? I use Aurfil or Connecting Threads. Hand quilting I use YLI. I just received my kit for the Snapshot quilt BUT I am on a mission to finish a antique Grandmother’s Flower Garden for someone before I start anything else. I’m on the third corner heading for the home stretch and hope to have the quilting finished this weekend. Binding next up and out the door! Then its time for a ME quilt! Have a Happy Valentines Day! I currently use Aurifil 50 for my piecing and was pondering what to use for quilting, so now I have some ideas. I tried the Connecting Threads thread, but I felt the thickness was contributing to my precision problems. Now I’m wondering if my real problem was with the steam pressing. I’ll be sewing a lot this lovely 3-day weekend (woo hoo!) and will try your starch/sizing saturation method. 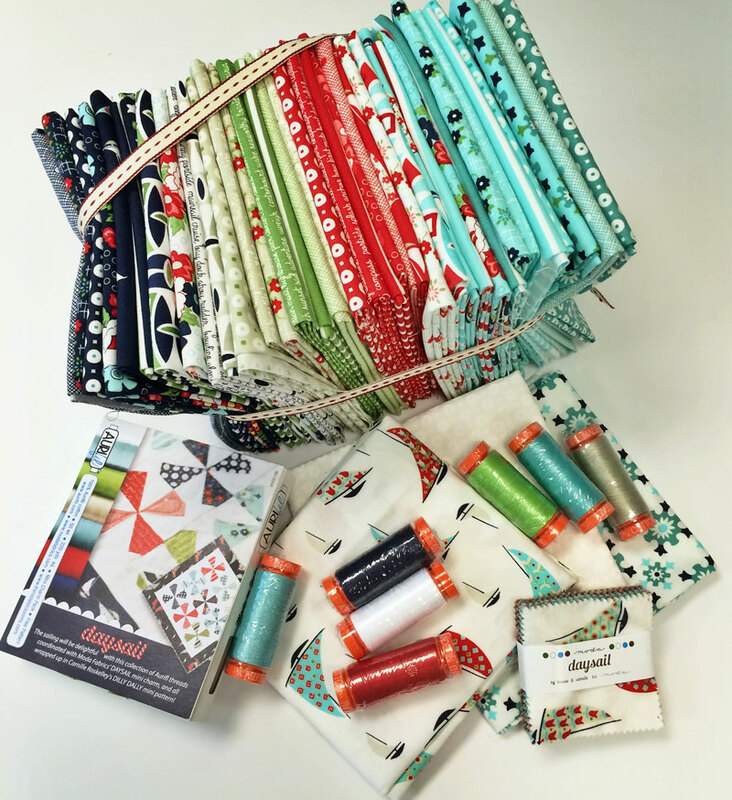 Seeing your APQ project reminded me that I need to start working up the last quilt kit I bought from your Miss Rosie site…. it’s got very similar looking fabrics… oh, Lucy! I am an aurifil girl too for almost all piecing. I like to use poly for Machine Quilting on my domestic machine, and I love Connecting Threads BLACK for buttonhole stitching. It is thicker than Aurifil and shows up nicely on my projects. I always use Hand Quilting Thread to bind and my favorite is Guterman. I have almost every color they make in hand quilting thread since I also am a hand quilter. I would love to know the difference in some of these threads, such as what makes Aurifil less linty than others. Thanks! I love to use Aurifil thread for piecing and hand applique! I’ve been using Aurifil Orange spool for piecing and machine quilting lately. The bobbins last a long time and my machine likes it but then again I could sew with a spool of wire and my machine would be happy. I do worry about the strength of Aurifil as it’s so thin and only 2-ply, the strength years down the road. I’m a 101% Aurifil girl … seldom change colors unless there is a darker thread in the machine and I’m doing something white … otherwise it’s a cream or light gray. Use it for everything! I really, really like that orange/black/cream quilt you’re making. LOVE the pattern. Will info on that be available soon? Not being a big “Halloween” person that would be a perfect quilt for me because it covers the holiday without being too kitchy … if you know what I mean. Look forward to your blogs and think you’re doing a GREAT job!!! Have a great weekend!! I use Superior So Fine thread 50 wt. it doesn’t leave lint in my machine. Use it for machine quilting as well. If I want the design accentuated, i will choose triple stitch rather then running stitch. I have a sewing/embroidery machine. First, I LOVE your APQ quilt a long quilt in the orange, black, and cream. Lovely color combination! I have been an Aurifil user since I discovered it. Love the 50 weight for piecing, and I stick to an off white or beige for most projects, since I tend toward light background fabrics. I have to admit, I have fallen for the Aurfil thread boxes, and have purchased several to match fabric collections I just had to have. I love your APQ quilt! As for thread, I generally use Aurifil 50wt or Coats Cotton for all my piecing/appliqué/quilting (hand and machine) or Guterman Cotton if that’s what I have – it generally depends on what I have in my stash that works with the colours I’m using! I tend to favour a pale grey or white thread for most of my piecing but yes, I do choose different colours for different projects. I always attach my binding with thread which matches either the binding or the quilt top and when stitching down the back I match my thread to the binding. Can’t wait to see what you do with Daysail – makes me just want to be floating on a pontoon boat some where!! 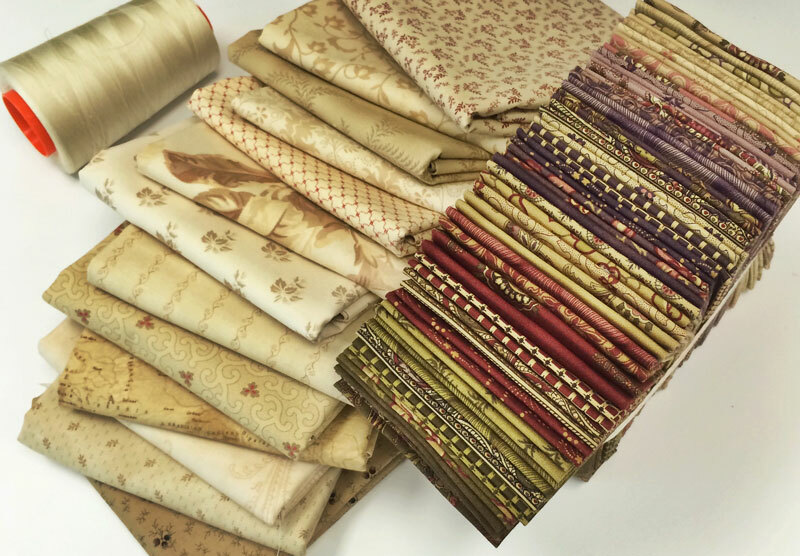 I use lots of Aurifil – mostly a taupe but I have picked up a few of the box kits and now using them up, I also don’t see the need to switch off colors unless I want something for quilting the top not piecing. If I’m piecing something really dark, I’ll use a charcoal instead of a black. Your APQ is looking great – wonder what it would look like if all the blk dark squares were going one way and the orange the other??? It’s probably already together. -LOVE the “Passport” fabrics, and I’ve seen them starting to come on line, haven’t seen them in the stores yet. Thanks for sharing it though – I have some other things in progress but hope to do one also. Just saying Carrie but if live in northwestern Pa. Heinz is catchup. If we’re given anything else we give it it back. Nothing like the real thing. Oh, I just love your new partnership with Moda. One question. Are you ever coming out a new book of quilts? I have everyone of them. They’re treasures,every one of them. Hi. I’m very interested in the fabric bundle in your post, Daysail. Is it new, is it available in a bundle or did you put your own fabrics together? I’ve looked at a few fabric stores online, but I haven’t seen anything like it. They are beautiful. Thank you. I love the idea of trading tips! I use Guterman or Coats & Clark thread just out of habit. For piecing, I use grey or eucr. I have never tried Aurifil or Connecting Treads Essential although I have thought about it. I would like to learn more about machine applique. I have pieces that I have ironed onto backgrounds but am afraid to try the sewing. I think I should learn this before trying hand applique. Baby steps.